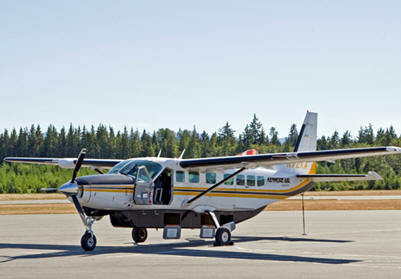 July 30, 2012 - Pratt & Whitney announce that Cessna Aircraft Company has chosen the PT6A-140 engine to power the latest innovation in the Cessna Caravan product line the Cessna Grand Caravan EX. "We are proud to launch this new PT6A engine for our long-time customer, Cessna. Designed specifically to meet their needs, the PT6A-140 is the first variant of next-generation products that produces 1,075 SHP thermal for significantly improved climb, cruise and take-off performance in hot and high operation," said David Van der Wee, Vice President, Business and General Aviation, P&WC. "This is the most powerful PT6A engine in its class and it provides the best power-to-weight ratio." "The core of this new engine is the next step in our continuous pursuit to bring the latest technology to the legendary PT6A family and establishes a new benchmark in its class, with the capability of meeting multiple demands across the agricultural, corporate and utility markets," added Van der Wee. "We have answered customers' desires for better performance and this engine demonstrates a 5% improvement in specific fuel consumption, through the incorporation of advanced aerodynamics, a more efficient compressor, and the latest generation of hot section materials. Furthermore, as part of our commitment to improving our products' environmental footprint, we have reduced the product life cycle impact through the use of the latest green manufacturing processes and materials." P&WC has completed all development validation of this new engine and received Transport Canada type certification for the PT6A-140 turboprop engine. The PT6A-140 engine features a 3,600 hour TBO with the benefit of a 6,000 hours/12 years TBO for specific conditions with FAR Part 121/135 operators. P&WC will be providing to operators the PT6A-140 with its Flight Data Acquisition Storage and Transmission System engine diagnostic solution. The latest innovation in P&WC's expanding suite of advanced diagnostic solutions automatically acquires, stores and transmits engine and aircraft data. Stored engine data is readily available for review and transmission to the customer the moment it is required for analysis to optimize engine operating and maintenance costs. The PT6A-140 builds upon the PT6A legacy of offering unmatched performance, durability, reliability and superior customer value to the market. Since introducing the PT6 almost 50 years ago, Pratt & Whitney Canada has consistently introduced newer versions of the engine, leading to more than 130 applications for business, commuter, utility and trainer aircraft and helicopters. The PT6A turboprop fleet has logged more than 335 million hours, an astounding amount that is 10 times more than its closest competitor. Others have made efforts to launch similar products; however, there is only one PT6!